Amethyst Chrystal was badly injured in a scooter accident in Bali. 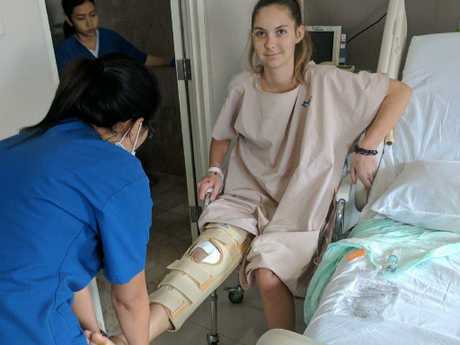 An Australian woman is warning travellers to think twice about getting on a scooter in Bali after she suffered horrendous injuries in an "impulsive" ride that went badly wrong. 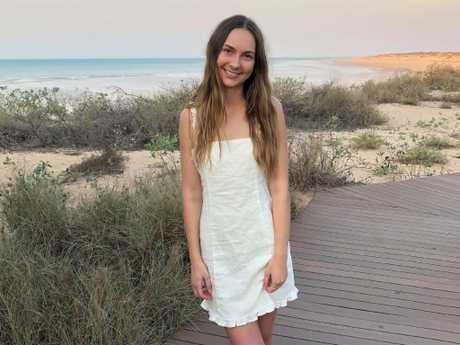 Childcare worker Amethyst Chrystal, 19, from Broome, had five facial fractures, a shattered kneecap, exposed femur, and tendons and ligaments ripped from the bone after her crash in Canggu in July. But she thinks her injuries could have developed into much worse - including possibly losing her limbs - had her insurance company not been able to cover her massive medical costs in a Bali hospital. And she's just one of a number of Australians to be involved in serious scooter crashes in Bali this year, including those who were killed. 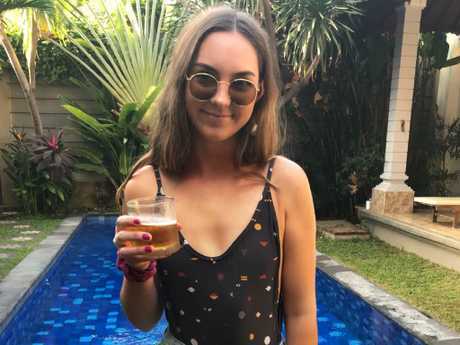 Amethyst, who has an Australian scooter licence, said she was initially hesitant to ride a scooter in busy Kuta but thought Canggu, where it was quieter, would be safer. "That being said, I decided to just be impulsive and we did hire scooters," she told news.com.au. "My friends and I all have licences for scooters in Australia so I didn't think it was that risky." Amethyst was badly injured in the scooter accident. But it was. And as she was riding pillion in the scooter with a friend, it crashed into the side of a taxi that was pulling out on the road. As well as the leg injuries, Amethyst suffered a fractured eye socket and cheekbone and two fractures in her jaw. 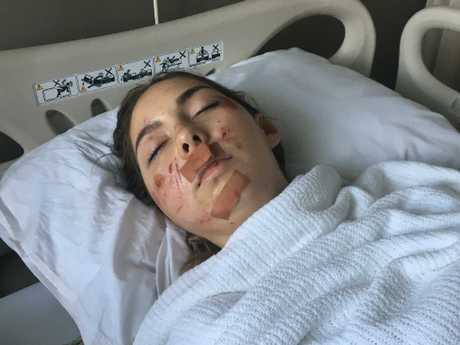 "I had to undergo eight hours of surgery to plate my facial fractures and to reattach my ligaments and tendons to my knee with a pin and stitch it up," she said. "I had another surgery (later) in Perth to remove the pin from my knee. "Due to my mandible fracture I had my jaw wired shut with screws - two top and two bottom with elastics to hold it shut for 10 weeks, meaning I had to drink through a straw and couldn't talk for four days while my swelling went down." Amethyst had serious facial injuries. Amethyst's insurer 1Cover arranged for her mum and sister to fly in from Perth as she spent a week and a half bed-bound at Bali's BIMC Hospital - including during a series of earthquakes that rocked the island, causing the hospital to be evacuated. She said staff at the hospital "exceeded her expectations" but their expenses were high. All up, the total cost to Amethyst was $62,000, including surgery, recovery and flights. "We wouldn't have been able to pay for any of the bills, just an overnight stay in hospital was up to $25,000," she said. "I wouldn't have afforded to have the surgery so would be stranded in Bali, literally unable to get back to Australia. I most likely would have contracted infections and maybe even lost limbs if I wasn't seen by those incredible surgeons." Amethyst was eventually flown home in business class on a Garuda flight but said it was a "scary experience". Her injured knee has needed intensive physio. "To be deemed fit to fly I was required to sit up for two hours without feeling nauseous," she said. "To express how daunting this was for me - a few days before leaving I could only sit up for 15 minutes before having to lie back down so I didn't vomit. I had my jaw wired shut so vomiting was extremely dangerous for my jaw and the risk of choking." Back in Australia, Amethyst continued to deal with the fallout from the scooter crash. "I had many appointments back in Australia to check my bite was correct," she said. 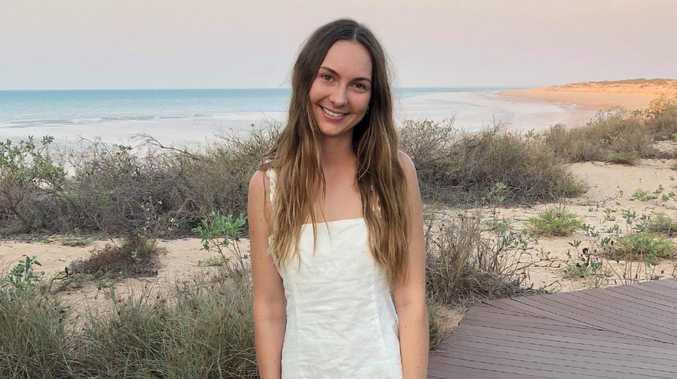 "I then had to get the screws removed from my jaw … I spent my time in Perth visiting the hospital weekly with appointments up until the end of September when I finally could get my jaw unwired. It was an extremely upsetting experience for me and I spent a lot of time depressed and anxious about the situation." Amethyst said she was on a very slow road to recovery and had to do physio daily to improve her injured knee. Amethyst won’t travel on scooters in Bali again. And that's been more than enough to put her off Bali scooter rides for good. "I do think hiring scooters is risky and I definitely wouldn't consider or recommend it after my experience," she said. "It's risky knowing that you're not in full control, you can't guarantee the other people driving around you won't cause an accident which is what happened in my case." She also said she would never travel without insurance. "I know a lot of people are thinking 'it's just Bali, I'll be fine' when in fact Bali is somewhere you shouldn't take the risk. It is so common for scooter accidents to occur overseas and you wouldn't expect it to happen to you or someone you know but it does and it can be fatal." This year has been another horror year for Australians killed or injured on scooters in Bali. Earlier this month, Sunshine Coast man Jacob Mabb died a week after he was left with horrific injuries after crashing his scooter in Bali. Jacob Mabb died this month after a scooter accident in Bali. The 21-year-old former surf coach crashed the scooter on November 25, suffering severe head injuries that left him in a coma. In October, Perth man Callan Jay Everts, 32, died when his scooter crashed into the wall of the Santo Paulus Church in North Kuta. Mr Everts, who was travelling with friends, died from head injuries in Sanglah Hospital soon after the accident. And in August, Sydney man Ollie Dousset lost his leg but was lucky escape with his life after the scooter he was riding on was hit by a cement truck in Uluwatu. "We essentially went underneath the rear axle of the truck," Mr Dousset said. "I stood up and I saw my calf muscle was on the ground next to my leg and I just kind of scooped up my leg into my hands and put it back together. I remember thinking I just have to get to hospital, I have to get to hospital right now." 1Cover's travel safety expert Richard Warburton said while bike and scooters in Bali were risky, so too was the worrying behaviour of young Australians towards travel insurance. Amethyst said she was lucky to have taken out travel insurance. "We have figures that show that up to 40 per cent of Aussies under the age of 25 don't take out travel insurance. This is despite us dealing with over 100 bike and scooter incidents worldwide, with over 80 per cent of these coming from Bali and Thailand," he said. "Bike and scooter accidents are so common, and they usually happen because of what we've coined the '7 Deadly Biking Sins'. There's riding on poorly maintained roads, riding shoddily maintained bikes, riding without a helmet, riding without a proper license, not obeying road rules, choosing badly lit roads, and riding while intoxicated. Even just one of these can lead to a devastating accident." Mr Warburton said travellers in Bali often saw locals riding around without helmets and were lulled into a false sense of safety. "(They) forget that people who have grown up in a particular environment are generally a lot more savvy. 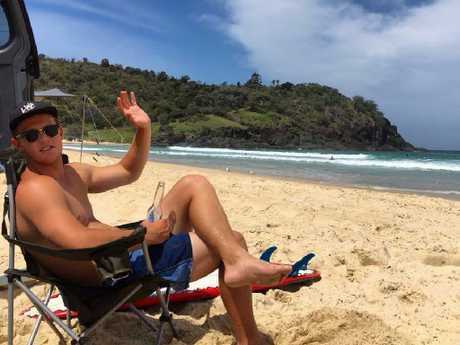 And it's so easy for anyone, not just Schoolies or young travellers, to have a devastating accident," he said. "People should ask themselves, 'would I do this at home?' If the answer is 'no', it's probably not the best idea overseas either."